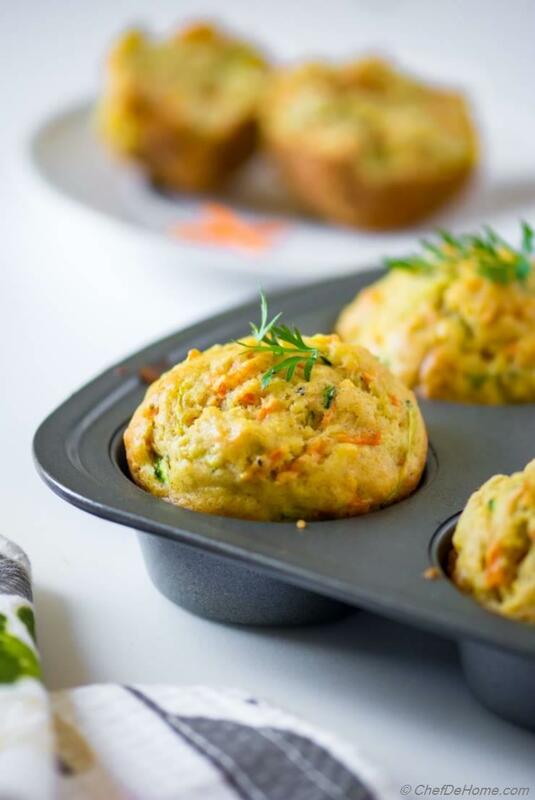 Sunday fun-day breakfast or a savory surprise in always-sweet Bake Sale, these Zucchini Carrot Muffins are perfect for both! 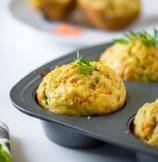 Carrot Muffins loaded with seasonal sweet zucchini, and fresh herbs. These muffins are moist, butter free, dairy free, and also not too sweet. 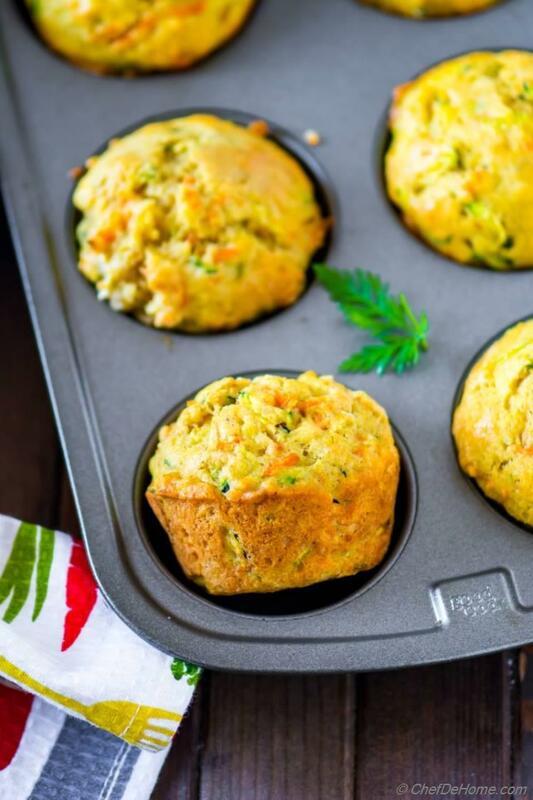 I call'em my all-in-one and easy, savory Zucchini Carrot Muffins. 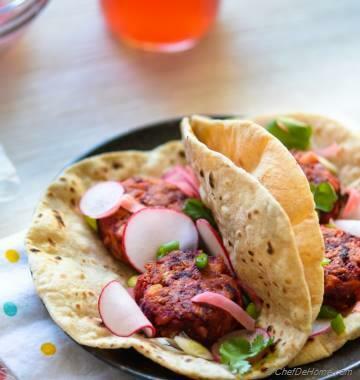 Easy because this recipe is super easy to put together. 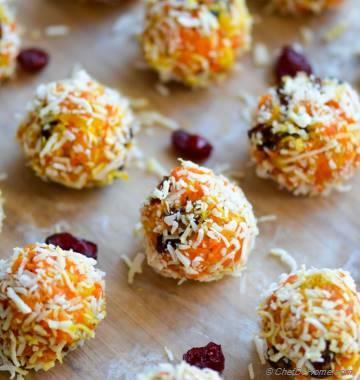 Al-in-one because these are delicious, loaded with veggies, and can be served many ways! Whether you planning a fun-day-Sunday breakfast at home or getting ready for a memorial bake sale? These muffins will be a nice surprise from everyday blueberry muffins and no one will notice there are - not one but two veggies in there. This also makes this muffin recipe perfect for serving for weekday dinner. 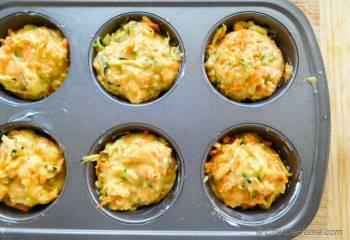 So tonight, hunt some zucchini and carrots from refrigerator... then ready a batch of Zucchini Carrot Muffins. 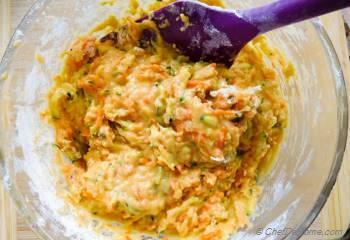 With just 10 minutes prep and just 1 bowl for mixing, this easy carrot muffin I promise! These muffins are moist, savory and has no butter, and are dairy free. I replaced the butter with some olive oil. Olive oil keeps these muffins moist. Also, it increases the shelf-life of these muffins. Plus no-butter makes these muffins good and healthier for everyday use. 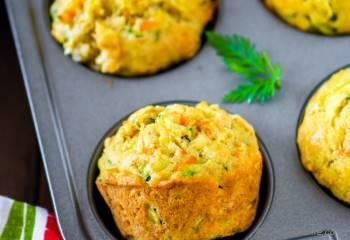 Carrot muffins are also not very sweet but savory. I don't like when everyday muffins are cloyingly sweet. I mean, I will enjoy a sweet blueberry muffin for brunch once in a while... but veggie muffins such as zucchini muffins, carrot muffins taste better when less sweet and bit savoury. I also replaced part of sugar with some agave syrup. Agave syrup is naturally sweet, and plus it also helps keeping muffins moist. You can also use honey instead of agave. Or, replace all sugar with agave/honey too. I did use eggs for this batch of carrot muffins. But these muffins can be easily made egg-less. For egg-less muffins, applesauce is the best baking egg replacement. It provides moisture to the muffin batter without affecting taste. I always prefer to use unsweetened applesauce. If using sweetened, I would reduce the sugar added in muffins by half. When to serve Carrot Muffins? 1. Bake Sale: Bring something different, savoury, loaded with carrot and zucchini, colorful to community bake sale. 2. Dinner Bread: Serve in dinner, for scooping your favorite curry or soup. 3. Breakfast: Serve for breakfast or evening snack, with some lite butter or low-fat cream cheese. I added zucchini, well, because I love Zucchini Muffins. Also, when in season, zucchini is so sweet and delicious. When I see fresh summer squash and zucchini at local farmer's market.. I just can't resist bringing some home. Then, it is everywhere until it lasts.. In soups, stews, curries, and in muffins. Are you a zucchini fan? Then, I highly recommend trying my Ratatouille and Summer Minestrone recipes. I hope you have fun Memorial Day Weekend! 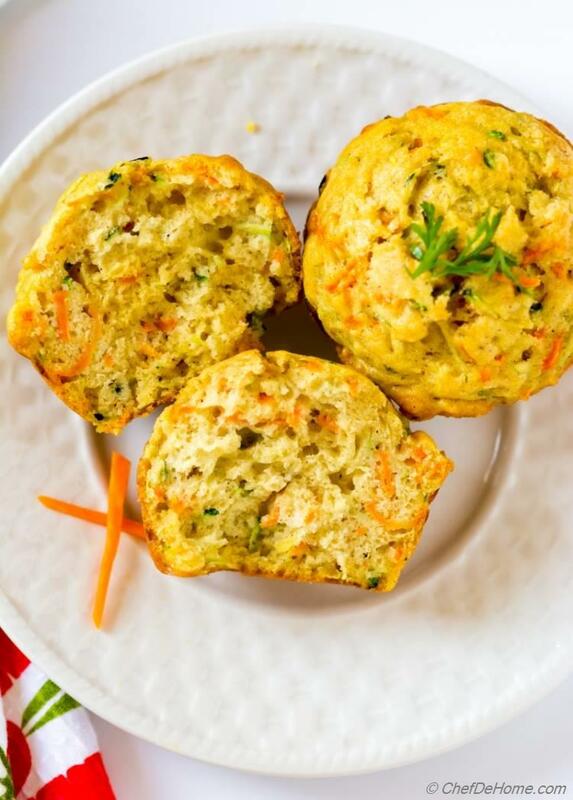 How about some main course to scoop with Carrot Muffins! 1. Preheat oven at 400 degrees Fahrenheit. Add dry ingredients - flour, baking soda, baking powder, salt, cinnamon, thyme, lemon zest and sugar, in a bowl. Mix well and set aside. 2. 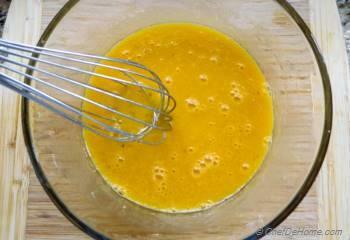 Add wet ingredients - oil, maple syrup, and eggs in a bowl. Whisk until fully combined. 3. 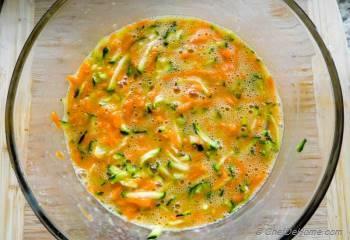 Add grated carrots and zucchini in the wet ingredient and mix well. 4. Fold in dry ingredients into wet in 2-3 batches just until batter is mixed in. Don't over mix. A few streaks of flour are okay. 5. Fill in muffin tins, dividing in 8-9 cups. Fill empty cups 1/2 with water. 6. Bake for 18-20 minutes or until tooth pick inserted comes out clean, and muffins are brown and springy to touch. Serve with warm butter for breakfast or on side with a lentils/stew. Enjoy! Add 1/4 cup chopped nuts or raisins for some texture. Have not tried them as No 5 step says fill half cup with water? Confused! Should it be mixture? No, its is not mixture but water only for “empty” tins. After filling batter in muffin tin cups, if there is cup left empty fill it half way up with water. This is a baking hack to ensure circulation of heat. I hope it helps.